SCDF NSF Shek Salmin ended his life, purportedly after a long bout of depression brought on by family problems and compounded by harsh punishments in-camp. In his final days, his Facebook posts became darker and darker. Yet, his friends seem to have only seen the happy side, with few people getting worried over him. Upon news of his death, there seems to be a outpouring of anger towards the National Service system. 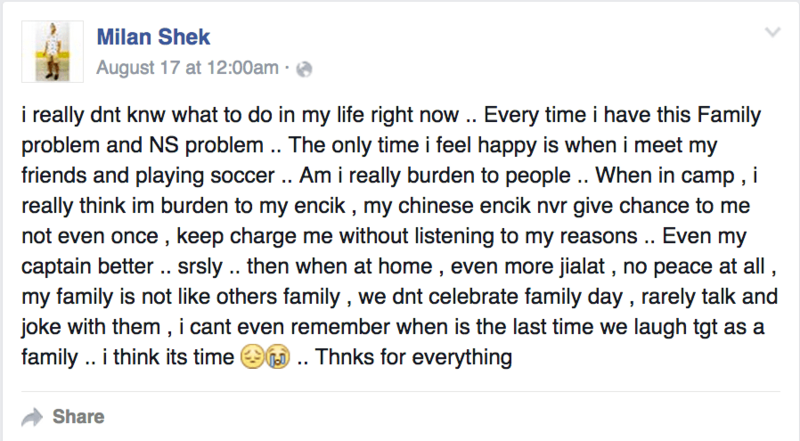 This rage, and his friends initial post about his death, fanned the flames for a witch hunt that has ended up with his superior, one SSG Tan Teck Beng, bearing the brunt of the online abuse. While I understand the rage of the Internet Mob, I think there’s something to be said about all of us in this situation: We still don’t talk about the ugly truth of depression and sadness until it’s too late. So we wait. We wait till someone dies before we come out and choose a target to place all our grief upon, to blame and to ask for a social recompense. National Service even gets dragged into it. The truth is, as a society, we still don’t know how to deal with depression.